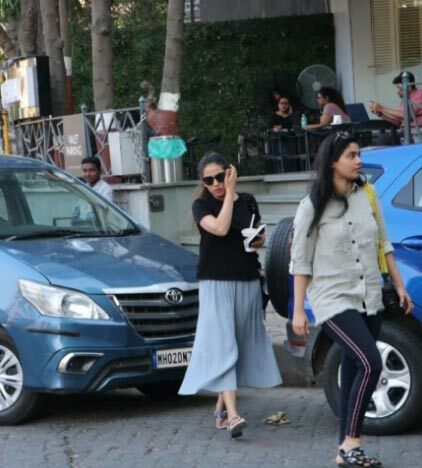 We love it when Mira Rajput gets papped in the city, and while sometimes, she is snapped with her husband Shahid Kapoor, on other occasions, she goes solo, today, she was spotted not outside her gym but was snapped outside a coffee shop in Mumbai. After giving us a hard-hitting blockbuster, Pink, megastar Amitabh Bachchan and talented Taapsee Pannu have reunited for yet another riveting and revenge thriller titled Badla and we must say it will surely impress the cine-goers. The whole of India is eagerly awaiting for Ranveer Singh and Alia Bhatt's Gully Boy. Critics have given it a thumbs up in the Berlinale Film Festival. The stars are travelling all over the country to promote the film. Ranveer Singh, Alia Bhatt and Zoya Akhtar were spotted at the airport. In fact, Ranveer recently touched 20 million followers on Instagram and celebrated like crazy. The makers of Lukka Chuppi have released yet another song from their album. After giving two party tracks, both of them remixed versions, the makers have released a romantic track and don't be surprised as you might have heard it before. Yes, Tanishk Bagchi has recomposed a hit Punjabi track, Photo for the Kartik Aaryan-Kriti Sanon starrer. The song will take you to the days when you were falling in love for the first time. Akshay Kumar kickstarted a countdown for his upcoming movie Kesari, wherein he promised his fans to share glimpses from the film today onwards. While sharing the glimpse, he wrote, "It’s an UNBELIEVABLE TRUE STORY. Presenting the first one from the..." Akshay also revealed that the trailer of the movie will be released on February 21. Vicky Kaushal's latest film, "Uri: The Surgical Strike", is on a record breaking run at the box office. The actor has received critical praise for his performances in films such as "Sanju" and "Manmarziyaan", among others. Vicky started 2019 with a bang with "Uri", which is still running to packed houses. Newly Vicky said to media, "You say that to yourself that now is the time you can't take anything for granted. You've to keep working hard, harder and hardest. It feels so special."